Yet again, it was another ‘must win’ game—and, yet again, the Reds won. This time banishing the ghost of 2015 as they defeated Chelsea by two goals to nil. It was a game full of emotion—before a ball was even kicked. This fixture marked Liverpool’s tribute to the Hillsborough disaster, made even more poignant that 2019 marks the 30th anniversary. Tributes were made pre-match by both sides and the minute silence was impeccably observed by the entire stadium as home and away supporters paused to remember those who went to a football match, yet never came home. When the game got underway, the old stadium was raucous; Anfield was a cacophony of noise that lasted the entire 90 minutes. As fixtures go, it was another nervous affair. 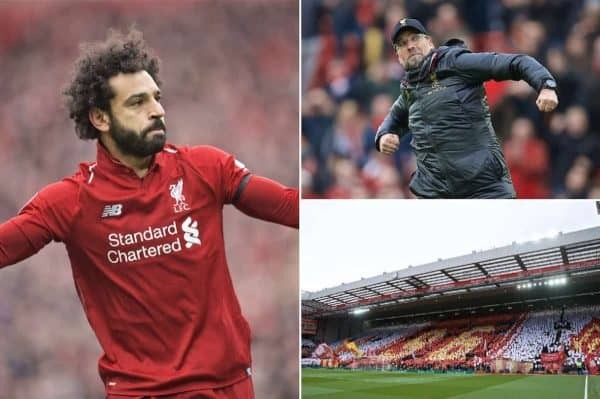 Probably not helped by the events of five years ago, but Jurgen Klopp was keen to impart to Liverpool fans everywhere that the only similarities that remain were the clours that both sides took to the field in. The first half came and went in the blink of an eye; Liverpool felt they were on top but Chelsea remained a danger through star man Eden Hazard. With Man City cruising past Crystal Palace in the Premier League‘s early kickoff, Liverpool knew only a victory would do as they came out for the second half. It only took the Reds eight minutes to show the watching masses that they were up for the title fight. First, Sadio Mane nodded home a Jordan Henderson cross and the Liverpool captain celebrated his part as if he’d scored himself! Sadio Mane, meanwhile, sank to his knees and thanked Allah above for what was his 18th goal of the season. Yet another crucial goal for the Senegal international, adding to his recent notches against Fulham and Bayern Munich. What followed next was simply sublime, ‘simply Salah’. Liverpool’s Egyptian forward let rip from outside the box and his shot almost took the net off. Anfield went wild; his strike—and what a strike it was—came 142 seconds after Mane’s opener. After being on the end of distasteful abuse by certain sectors of the Chelsea support this week, the Liverpool forward answered back in the best way possible—with a goal of the season contender. Players and fans alike knew they had witnessed something special. It was a goal worthy of winning any game, especially one as big as this. Jurgen Klopp once again celebrated with the Kop at full time and the bond between the two only grows stronger as the pressure become more intense. Liverpool now travel to Portugal where they face Porto, in the second leg of their Champions League quarter-final tie. The prospect of an unbelievable Premier League and European double still looms large.